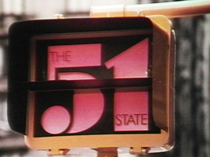 During the years of 1972-1976, over 300 programs were created for the series, The 51st State. These programs existed on 16mm film, and 2" Quad and 3/4" Umatic videotape. Although many programs were produced, Thirteen's Tape Archive staff was able to find approximately 57 unique programs within its collection. Many of these programs were produced and aired during the years 1973 and 1974. With a grant from the National Historical Publications and Records Commission (NHPRC), the series collection now includes modern broadcast quality formats (Digital beta and Betacam SP) and viewing copy formats (DVD and VHS). The available program records can be browsed by subject (assigned using Library of Congress Subject Headings) or personal name (includes names of individuals who participated in a program or who were the topic of discussion). Additional unique programs were added to the collection through contact with producers and staff who worked on the series and also from copies available at the Museum of Television & Radio in New York. Ongoing research will be done to continue locating and culling additional programs from the series held at other repositories and libraries nationwide.